Everyone is forced to face the heaping pile of guilt that has been plaguing them for twenty years. Bringing Park Il-do to justice won’t be an easy task, but will our stalwart trio be able to stop blaming each other (or themselves) long enough to capture this vengeful spirit? Or will Sohn continue to destroy them? Kil-young wearily watches as the police take care of cleaning up the mess — literal and figurative — of Min-sang’s crime scene. Detective Go finds it hard to believe that Hwa-pyung “coincidentally” was involved, just like he was “coincidentally” involved with Young-soo’s case. Exhausted, Kil-young says she doesn’t understand it, either. Min-sang’s mother emerges from her house and marches up to Detective Go, ordering him to tell the police to leave. She’s annoyed by all the fuss everyone is making. Kil-young points out that her sons killed people, but Mom doesn’t care. She just wants the police to leave her and her neighborhood alone. At the cheap noodle place, Hwa-pyung is already waiting for Kil-young. When she arrives, he tells her that Yoon is on his way to meet her, too. She decides to leave before he gets there — she’s not exactly fond of priests. But she gives Hwa-pyung a bag of medicine and bandages for his hurt hand. Hwa-pyung says she should buy him a decent meal, instead, so she grabs the bag to take it back, but Hwa-pyung snatches it from her. He can’t exactly drive his taxi right now, so he needs to save all the money he can. He asks her how the case is going, and Kil-young muses that Min-gu will get off with a light sentence due to his mental state. She adds that she’s seen a lot in her years as a detective, but she’s having a hard time believing what she’s been seeing lately. She asks if this “Park Il-do” is really the one affecting people. Hwa-pyung confirms it, explaining that Min-gu and Min-sang’s hatred of women didn’t directly come from Park Il-do, but from their mother and her abuse of her sons — Park Il-do was just feeding off the hatred they already had. Kil-young wonders what’s worse: a demon like Park Il-do that possesses people, or a mother that gave the two men such a horrible, scarring upbringing. She asks Hwa-pyung why he spends so much time tracking down the Park Il-do boogeyman when there are already terrible humans in the world, and he simply tells her that someone has to stop Park Il-do. Besides, it’s personal. As she stands to leave, hoping to avoid Yoon, Hwa-pyung thanks her for saving his life. Again. Kil-young warns him that he’ll probably die if he continues on like he’s been doing. Kil-young runs into Yoon just outside the noodle place. She politely greets him and continues to walk away, but he thanks her for her help. She shrugs it off — after all, she’s just doing her job as a detective. But she turns around once more, wondering if she’s met Yoon before. He points out that they met that night at the shamen’s, but she means before that. When he asks if she goes to church, Kil-young curtly tells him that she hates churches. Then she turns and walks away. Yoon and Hwa-pyung step outside to talk about Park Il-do — and Priest Choi. Yoon refuses to believe that his older brother is possessed by Park Il-do, but Hwa-pyung knows better, presumably thanks to his psychic senses. 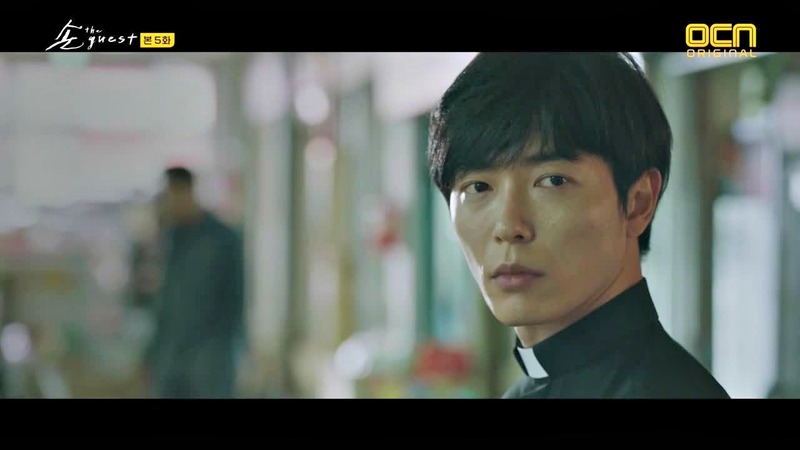 He reveals that Yoon became an exorcist priest in order to find Priest Choi and save him. Hwa-pyung warns Yoon that Park Il-do is looking for him, repeating what the demons inside Young-soo told him about looking for the younger brother. Yoon refuses to believe it and walks away as Hwa-pyung shouts warnings after him. He asks that Yoon contact him if Yoon sees Priest Choi. At home (and in casual clothes! ), Yoon stares at his priest’s frock. He then pulls out a family photo from his desk drawer. It shows him as a young boy with his parents — but when he unfolds the bent photo, his older brother is standing next to them, smiling. Hwa-pyung parks outside Yoon’s home, keeping watch since he’s sure Park Il-do as Priest Choi will visit Yoon at night (since a demon doesn’t exactly want to visit the church where Yoon spends his time during the day). Yook Kwang is there, too, grumpy that Hwa-pyung keeps dragging him into this mess. But when Hwa-pyung says that Yook Kwang can go home, the shaman retorts that he can’t leave his friend to deal with this alone. Aw. Except he gets a call from a lady friend and makes an excuse to leave. Yook Kwang is concerned, though, that if Park Il-do comes when he isn’t there, that Yoon wouldn’t be able to perform the exorcism since Yoon would have to perform it on his own brother. Hwa-pyung shrugs and says they’ll at least have to try, but his vagueness worries Yook Kwang — who still leaves to help his lady friend. Ha! As Hwa-pyung keeps watch, he thinks about his mother and grandmother’s deaths. Alone in the car, he glances in the backseat at a large knife in his bag — the option of last resort. It starts to rain — not just on Hwa-pyung’s car, but out in the countryside as well, where a hiker pokes around in the bushes, startled when he finds a human skull. In the morning, it’s still raining. Yoon steps outside towards Hwa-pyung’s car where Hwa-pyung has fallen asleep, but stops when he receives a call from Priest Yang. Yoon freezes when he hears what the other priest has to tell him. Hwa-pyung wakes up and gripes about the rain, wondering why Yoon is up and about so early. At Yoon’s stunned expression, Hwa-pyung asks what’s wrong, and Yoon reveals that they’ve found his brother, Priest Choi. Or at least his body, since that was the skeleton the hiker discovered. That certainly changes things, and Yoon drives back to his hometown. The forest is a crime scene now, with the police blocking it off from all the news reporters. With Young-soo’s echoing scream reminding us that Priest Choi was on his way to be reunited with his brother, the medical examiner reveals the skeletal remains of Priest Choi. Yoon stares at it — and the barely discernible ID card, clothing, and crucifix that were with the body, making it clear that this is definitely his brother’s body. The medical examiner’s verdict is that it’s suicide, since the spinal cord was broken and there was a piece of rope nearby — it’s assumed to be death by hanging. Priest Yang is also there, and gently tells Yoon that suicide is a common way people deal with being possessed. Yoon finds it hard to believe, though, pointing out that his brother’s body was found buried deep in the ground, not hanging from a tree. Hwa-pyung talks to the hiking grocer who found the skeleton, trying to casually get more information about Priest Choi’s body. He plays it off as a curious hometown boy in order to get the man to talk. The grocer accepts a bribe and reveals that he wasn’t even sure why he went to that area when he was hiking. The man says he almost felt compelled, but assumes the skeleton was revealed after all this time since it was raining a lot and the soil was washed away. Kil-young gets a warning from her boss to stop being such a renegade and leave cases that aren’t hers alone. Detective Go tries to stand up for her, pointing out that, thanks to Kil-young, they were able to catch the suspects and prevent more deaths, but her boss is not pleased with her stubborn attitude. She gets a call from someone and freezes when she hears the voice on the other end. It’s the police chief from her hometown — and, from the way she reacts, someone personal to her (presumably her father). He apologizes that it’s been so long since he’s spoken to her and asks how she’s doing. Kil-young, still frozen, can barely speak, but says that she’ll stop by and visit. Yoon and Priest Yang try to get more information about his brother’s case, but it’s still an ongoing investigation. As they leave the station, they run into Councilwoman Park Hong-joo. She pleasantly greets Priest Yang, asking about his Sharing Hand charity. Yoon watches her warily, but Priest Yang practically beams as he tells the younger priest what an amazing, wonderful, and generous woman Hong-joo is and how much he appreciates her being on the charity board of directors. She’s at the station to meet with the police chief. She asks about the body they found, and he explains that they assume it was a suicide. She tells him to stop investigation since she doesn’t want her hometown to get negative publicity, but the police chief cautiously explains that it was a very popular case twenty years ago, so it’ll be impossible to avoid talking about it. Suddenly Hong-joo bellows at him to stop investigating. She also shrieks at her staff to get out, then she dangerously — and, in a way that makes my possession sense all tingly — glares at the police chief. She orders him to stop the investigation, reminding him how much she’s helped him over the years. Avoiding her eye contact, he meekly agrees. Depressed, Hwa-pyung calls Yook Kwang, whining that for all these years he’s been obsessed with tracking down Priest Choi, only to realize that Priest Choi has been dead the whole time. He assumes Park Il-do must have transferred to a new host right before Priest Choi died, which means Hwa-pyung now has to figure out who Priest Choi talked to twenty years ago. Yoon sits in a restaurant, unmoving as he eavesdrop on a gossipy couple talking about the incident from twenty years ago, when Priest Choi killed his family. The gossips assume that the family must have been involved with a crazy cult. Priest Yang tells Yoon not to take it personally, and Yoon says he’s been dealing with the rumors his whole life. Priest Yang pours himself a hefty glass of soju, which concerns Yoon as he asks if the older priest is drinking again. He worriedly walks the tipsy Priest Yang to the bus, making sure he’ll be okay, but Priest Yang wonders if Yoon will be fine on his own. Before the bus leaves, Yoon demands that Priest Yang answer one question, one he’s avoided answering all this time: why did his brother, a devout believer, become possessed and kill his family? Sighing, Priest Yang says that Yoon’s brother wasn’t the devout believer — it was Yoon’s parents. They were the ones who wanted Yoon’s brother, against his will, to become a priest. Priest Yang assumes that Yoon’s brother must have resented them for it, which was a gateway for the demons to possess him. But he reassures Yoon that Priest Choi loved his family, especially his little brother. Priest Yang blames himself for bringing Priest Choi that day, and his voice trails off. Yoon demands to know what he means, and Priest Yang reluctantly explains that he and Priest Choi went to exorcise a shaman’s kid who was possessed by Park Il-do. Priest Yang adds that the child — now a grown man — recently visited him, looking for Yoon. He says that the man had a prophecy that Priest Choi was looking for his younger brother. Yoon asks who that man was. Hwa-pyung spends the night with his grandfather, blithely telling him it’s because he has some time off from work. But Grandpa knows that Hwa-pyung’s been asking around about Priest Choi. He angrily tells Hwa-pyung to stop looking for Park Il-do. Grandpa doesn’t care that Hwa-pyung wants to prevent Park Il-do from possessing other people — he’s just concerned that the strong spirit might possess his grandson again. Hwa-pyung reassures Grandpa that it won’t — he was a weak child back then. Park Il-do won’t possess him now. But Grandpa literally flips a table, insisting that Hwa-pyung stop trying to find Park Il-do. Irritated, Hwa-pyung leaves Grandpa and drives out to the crime scene where Priest Choi’s body was found. He’s not the only one, since Yoon also stands in front of the site where his brother’s body was buried. He imagines Priest Choi hanging himself from the tree. Hwa-pyung finds him, and Yoon asks why he’s there. Hwa-pyung says that he was suspicious about the circumstances behind Priest Choi’s death and wanted to investigate when the police weren’t around. Furious, Yoon grabs Hwa-pyung by the collar, screaming that Hwa-pyung was the reason his brother was possessed in the first place. Hwa-pyung agrees, fully accepting Yoon’s blame. A flashlight in their faces distracts them. Kil-young orders them to leave so she doesn’t arrest them for disturbing a crime scene. Hwa-pyung grumbles that it isn’t even her jurisdiction, but she drives them to a very familiar place — Yoon’s old home. Hwa-pyung wonders why they’re there, and Kil-young explains that twenty years ago, a family was killed here, including a policewoman who had been passing by at the time. The policewoman died helping the youngest son escape. Kil-young turns to Yoon and confirms that his brother was the one who killed everyone. Yoon defensively asks why she wants to know, and she says that her mother was the policewoman who died to save his life. Yoon stares at her, stunned, as Kil-young angrily says that she’s never forgotten that night and has been trying to hunt down the killer for years. It’s the main reason she became a detective. Tears fill her eyes as she admits she wanted to be the one to catch him, but she found out he died twenty years ago. Hwa-pyung interrupts, telling her Priest Choi wasn’t the killer — it was Park Il-do that possessed Priest Choi. Annoyed, Kil-young tells him to stop it with the Park Il-do stuff, but Hwa-pyung stares at the house as he explains that when he was a boy, he was possessed by Park Il-do and Priest Choi tried to help him. So he went to this house to meet with the young priest, but he couldn’t enter because he sensed something terrible. A woman driving by stopped and, assuming he was being abused, went to investigate. Kil-young realizes that Hwa-pyung was that little boy. Hwa-pyung’s voice trembles as he admits that he’s the reason Kil-young’s mother went into the house — and to her death — twenty years ago. Kil-young punches him in the face and knocks Hwa-pyung down. He just sadly stares at her as she raises her fist to punch him again. He’s willing to take his punishment, but Kil-young just gets back into the car and drives away. She relives the last night she saw her mother alive, when she had been a grumpy pre-teen, refusing to talk to her mother. Mom apologized for being late to pick her up at a friend’s house since she was preoccupied with a case — and then reassures young Kil-young that she didn’t forget it was Kil-young’s birthday. Kil-young stubbornly kept ignoring her mother and giving her the silent treatment, including when Mom stopped the car to check on the little boy standing in the middle of the road. Mom reassured Kil-young that she would be right back. Adult Kil-young dazedly sits at the police station, staring at nothing. Detective Go brings some food, telling her she didn’t need to come back to work after visiting her hometown. As she shoves noodles into her mouth, she casually tells Detective Go that she found the person who killed her mother — but he’s dead. Detective Go is thrilled for her, anyway, since he knows that tracking down her mother’s killer has been her lifelong goal. But Kil-young continues to stuff her face as she tries not to cry, thinking about how if she hadn’t been angry at her mother for being too busy to pick her up at school on her birthday, she wouldn’t have gone to her friend’s house, and they wouldn’t have driven down that road that night. Kil-young starts to sob as she blames herself for her mother’s death. Hwa-pyung returns to his grandfather’s house and watches the old man sleep. Grandpa wakes up, saying that he hasn’t slept well since that night twenty years ago. Every time he closes his eyes, he wonders if there was anything else he could have done. He blames himself, adding that Hwa-pyung’s mother was so young and full of life — he should have been the one who died. Hwa-pyung tells him to stop talking nonsense, but Grandpa says that Hwa-pyung should forget it about it and live his own life. It’s not like the dead can return, and they both know how terrible Park Il-do is. If something happened to Hwa-pyung because of his search for Park Il-do, Grandpa would kill himself since Hwa-pyung is the only thing he’s living for. In the morning, Yoon sits in the crematorium waiting room, waiting for his brother’s ashes. He finds Hwa-pyung there, too. Hwa-pyung wonders if Yoon is okay with the case being closed like this — Priest Choi being declared a suicide — then wonders where the rest of Yoon’s family is. Yoon cooly explains that everyone believes his brother was a murderer. Yoon admits that he did, indeed, become a priest in order to save his brother. Except his brother was already dead. Sighing, he says it’s probably for the best, since even if Yoon could have performed the exorcism, his brother would have had to live with the knowledge that he killed his parents. Yoon confirms that Hwa-pyung believes Park Il-do possessed his brother, then asks what they need to do to find the spirit. Hwa-pyung warns Yoon that if he goes down this path, he won’t be able to go back to his normal life. Late at night, a woman walks to the rooftop of a tall building. She stands on the ledge and looks down. She receives a text and watches as messages pop up, as though she’s having a conversation with someone. She asks what she’s supposed to do, and the mysterious person tells her to kill. She goes to a restaurant where a group of office workers are leaving after drinks. She puts on red lipstick and then follows one of the drunk office workers to an underground passageway. The lights flicker as her high heels click-clack behind the man. He turns around, and the woman — looking like a creepy ghost, with her white dress and long hair — stares at him as she pulls out a large knife from her purse. The man starts to run but trips and falls. She grabs him by the hair and is about to cut his throat when she hears a group of drunk men nearing. She escapes before they notice what’s going on, and the man is left unharmed. Detective Go and Kil-young are on a new case. They’re investigating a possible murder — but there’s no body, and the traces of blood they find in the apartment have all been carefully cleaned up. They decide to bring in the girlfriend for questioning — it’s the same woman who was going to kill herself, then was persuaded by the demon-text to try and kill someone else. The woman meekly says that she broke up with her boyfriend a couple of months ago so they hadn’t talked recently. She didn’t know he was missing. Kil-young eyes her suspiciously as Detective Go asks all the questions, but the women genuinely seems distraught as she explains that she doesn’t know anything. Kil-young’s convinced she’s hiding something, but Detective Go says that she’s probably still emotional from the break-up. Yoon gets a call from another parish asking him to talk with a young woman who’s convinced she’s possessed. It’s the same women from before. Yoon asks her what symptoms she has, and the woman explains feels like someone is watching her from the darkness, no matter if it’s day or night. Suddenly she’ll discover she’s in a strange place, with no idea how she got there. She also receives text messages from a mysterious person who said they got her number from some guy. The messages keep telling her to kill people. But when she looks at the phone the next day, the messages aren’t there. Yoon gently asks if she’s considered talking to a psychotherapist. The women defensively asks if Yoon believes her, and Yoon says that he thinks it would be best for the woman to speak to a doctor — not an exorcist. As she turns to leave the church, Yoon asks her who gave out her number. The woman says she doesn’t know who it is, but she remembers the name: Park Il-do. Meanwhile, Kil-young and Detective Go continue to investigate the mysteriously missing person, Kang Jong-ryul. They stop by the man’s workplace — his supervisor is the man the woman tried to kill last night. The supervisor explains that Jong-ryul quit without reason about a month ago. Kil-young asks if the supervisor knew that Jong-ryul had a girlfriend, but no one really knew much about Jong-ryul. He only worked there six months and didn’t get close to anyone. Phone records indicate that the day Jong-ryul went missing, he spoke to his girlfriend. That means the woman was lying, so the detectives decide to talk to her again. In her bedroom, the woman texts with the mysterious demon, who tells her to kill again. She says she can’t do it, but the demon-texter says that she’s an idiot, and if he were her, he’d kill himself. The woman starts to cry, then lifts up her head and walks to her vanity, where she carefully applies her blood-red lipstick. She fills her bag with knives and leaves the apartment — where Yoon and Hwa-pyung are just arriving. She yells at him to move aside, calling Yoon a worthless orphan. Then she threatens Hwa-pyung, telling him his grandfather will die soon, just like his mother and grandmother did. But that’s just proof she’s possessed, and Hwa-pyung calmly asks where Park Il-do is. When she panics and tries to protect her bag, Hwa-pyung grabs it from her — and finds a brochure for Sharing Hand. He demands to know where she got the brochure, and the woman suddenly flops on the ground. Yoon rushes to help, but she screams that these men are hurting her. Concerned passers-by grab Yoon and Hwa-pyung and the woman escapes back into the apartment. Her phone buzzes. The demon-text says that she needs to kill everyone. Detective Go and Kil-young arrive to find Yoon and Hwa-pyung arguing with the police and passers-by that they weren’t trying to hurt the woman. But she steps out of the apartment, her wrists bleeding as the demons chatter inside her. I love that this director is so thoughtful about how he blocks his scenes. When Kil-young took the men back to Yoon’s house, they were standing in the exact same spots they did as children twenty years ago, bringing home the emphasis of how powerful that night was to all of them. They’re still scared children, trying to recover from that brutal night and seek closure — just in their own ways (which all involve Park Il-do, whether Kil-young wants to believe it or not). I also love that the crematorioum waiting room scene was a callback to the waiting room at the funeral home, when Hwa-pyung was so desperate to get Yoon’s help to exorcise Young-soo. Except now Yoon is in Hwa-pyung’s spot, desperate for Hwa-pyung’s help track down Park Il-do. It’s those little, thoughtful touches that make me love this director so much — and help me overlook how much he enjoys shooting so many scenes in the dark. Well, at least I try to, since it’s hard to appreciate the spooky when you can barely even see it. I’d say it was on purpose — since things are scarier when you can’t see them and instead let your imagination fill in the details — but this is a long complaint I’ve had with the director since Voice and Black. He’s so good at artistic shots and lighting — but would it really hurt to make scenes just a little brighter? However, I’m so happy that Yoon and Hwa-pyung have pretty much agreed to team up. If only they can get Kil-young to officially sign on to the Scooby gang, instead of being irritated that they keep showing up at her crime scenes. There’s obviously a lot of demonic crimes that need to be solved, and this trio are proving they can’t be beat when they work together.